Watch this spot. We'll post all updates and news here. September 2012 - Cash Mob is up and running with new members being featured each month. Please make sure you keep an eye on our home page to see who is up this week. We appreciate your support to these members and their businesses! July 2012 - Finally released from the cyberbully! I did get my domain name back that this lunatic squatted on for two years while using my name as a domain as a scare tactic and threat. I won the court case and slowly started publishing my story online at JulieRyals.com. Thank you all for the support during this crazy experience and your notes of encouragement. I have learned a lot throughout this process and realize that bullying isn't just among the kids - it's clearly involving adults too. My words of advice are to be strong and stand up tall - truth will prevail and the bully will come tumbling down. I also want to thank Joanne Kidd who dealt with this same bully at the same time. During this process she was my strength as well as confidence and because of what this bully did to us, we've become true friends. Her own story is also online so people can learn from her experience and possibly feel comforted in knowing someone else has been through what they may be dealing with. January 4, 2012 - Text Link Moms Program Update Released. 03/01/08: New Head Moderator, Peggy Announced. 10/01/07: Holiday Shopping Lists opens for another season! 03/29/07: DIYShoppes.com Opens! The answer is finally here! A DIY (Do It Yourself) Shoppe with so many features that we had to list them on it's own page! Create your own web site and online shopping store front that gives you the freedom and peace of mind that YOU actually own YOURSELF. These winners have 7 days to contact us here and send your Name, Shipping Address, Email, and Web site name from above list. We'll also need to know your first and second choice in sizes. Size quantities limited. 11/14/06 - Mom Pack has some new things coming! Watch our site for details!!! 11/10/06 - The Mom Pack T-shirts are here! We've bundled and packaged them up for shipping. We're going through the Mom 2 Mom Directory, verifying our buttons, banners or links on the index page and picking winners! 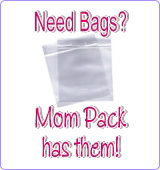 Thank you for your support to Mom Pack and it's members. 09/08/06 - Mom Pack T-shirts should be on site within the next 10-14 days! 09/01/06 - We are tired of Angela Ledcke and her lies, scams, fraud, and constant disturbances on Mom Pack and elsewhere. A reference site to keep everyone updated on where to protect yourselves is now available at Busted Scammers. You'll want to keep up to date - so add this site to your favorites! 08/29/06 - LovelyStitches.com offers one of their custom bags to a member that has a link to mompack.com on the main page of their site! 08/29/06 - Today we have an appointment to approve the Mom Pack Tshirts. TBA soon! 08/07/06 - Text Link Moms Updated & we cleaned house! Anyone added prior to 5/25/06 was deleted. Re-add yourself to be included again! 07/14/05 - FontShoppe.com Opens - FREE Fonts! 06/01/05 - Mom Pack Web Hosting discounts for members. Click Here to view details. 06/01/05 - Become a Web Host through Mom Pack & The Design Shoppe! Check it out! 05/30/05 - Text Link Moms Updated. 04/25/05 - Text Link Moms Updated. 03/20/05 - Text Link Moms Updated. 1/05/05 - Text Link Moms Updated. All participants: Please grab the latest html. 12/12/04 - Text Link Moms Updated. All participants: Please grab the latest html. 11/30/04 - Added another free printable for Christmas - CLICK HERE AND more HERE! 10/25/04 - Text Link Moms Updated. All participants: Please grab the latest html. Just ADDED! Mom Pack on the Today Show LIVE! 8/24/04 - Mom Pack Coupon Center goes live! These are one inch glossy circle stickers with your company name and the girl logo. The stickers are VERY small. We do not suggest using these for long company names.